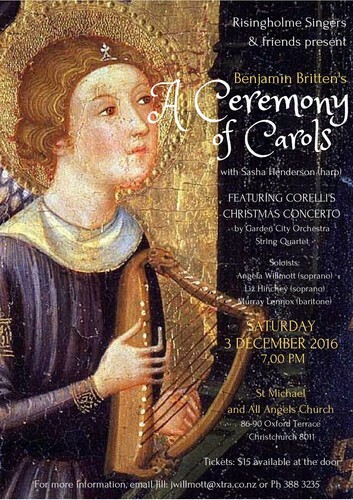 RIsingholme and friends present Britten's "A Ceremony of Carols", conducted by Khin-Wee Chen and accompanied by Sasha Henderson (harp). Soloists: Liz Hinchey and Angela WIllmott (sopranos), Murray Lennox (baritone). Guest performance by Garden City Orchestra's String Quartet, playing Corelli's "Christmas Concerto". Tracy Melzer (violin 1), Barbara Nieh (violin 2), Jvala Schelling (viola), Sylvia Nissen (cello).